♦ An event must be presented at least seven times before it sounds important. Examples: The district chair will attend the meeting. District Chair Joe Smith will attend the meeting. Examples: The district is holding a training event. The Skyline District is holding a training event. Place the date and location at the top of the page. Keep content current. Update webpages immediately following an event. Place the year after the date (July 1, 2018). Write dates July 1, 2018 (not July 1st, 2018). At first mention of an acronym, write it out as well to explain its full meaning the first time used (e.g., DE, SHAC, NYLT, JOTI). Avoid symbols and abbreviations (e.g., Tues, @, &). Do not use copyrighted materials. DO NOT WRITE IN CAPITAL LETTERS. Spelling errors make us all look BAD!! Place contact information at the bottom of every page. Do not use Oxford comma (also known as serial comma). Phone numbers should be written as (713) 756-8111. Maintain website style (fonts, size, style). Do not place council or national information on district websites, rather write a short description and link to the council or national webpage. Do not create or link to outside forms or surveys (e.g., Google docs). These can be created on the website. Keep writing style formal (avoid flippant comments, unnecessary words, ambiguity, sarcasm, and sentences that are too complex). Avoid writing in personal language (e.g., pronouns). For example, do not say..."you need to register by 1/1/18." Instead, say "participants need to register by...". Avoid personal judgement words (e.g., I think, I feel). State facts. Use 3rd person or "it." Activity pages should be very detailed. List everything a parent needs to know (who, what, when, where). Also, list what to bring, tentative schedule, rules, events and program details. If a question and answer style is needed, a frequently asked template can be added (e.g., NYLT). Templates can be used on pages with a lot of content to make the web page appear less daunting: frequently asked questions (e.g., NYLT), tabs (e.g., Training Schedule), accordion (e.g., Program Guide). 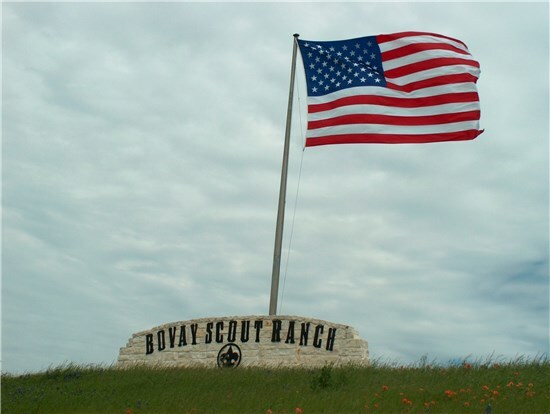 Use the URL www.samhoustonbsa.org for non-Scouters (e.g., recruiting new Scouts or FOS). 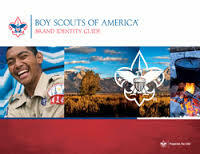 www.shac.org can be used with those familiar to Scouting. Some urls point to same page (e.g., www.shac.org/el-ranch-cima and www.shac.org/cima). Additional websites cannot be created for district or council programs or events (e.g., separate day camp website). The district executive and council marketing chair is to be provided the administrative password to all district social media accounts. At least two volunteers and a profession who must have administrative access. The content editor is much like common word processors. The most common practices are introduced below. The editor provides a clean and simple user interface. If you are familiar with desktop word processors like Microsoft Word or OpenOffice.org Writer, you will quickly see that using an online text editor is just as easy and intuitive. Toolbar – the section at the top of the editor containing grouped menu buttons that give you access to various functions of the editor. Editing Area – the space below the toolbar where you type your text and add media. Context Menu – a small pop-up menu with shortcuts to most common operations available for the object, visible after a right mouse button click or pressing the Application/Menu key on your keyboard. 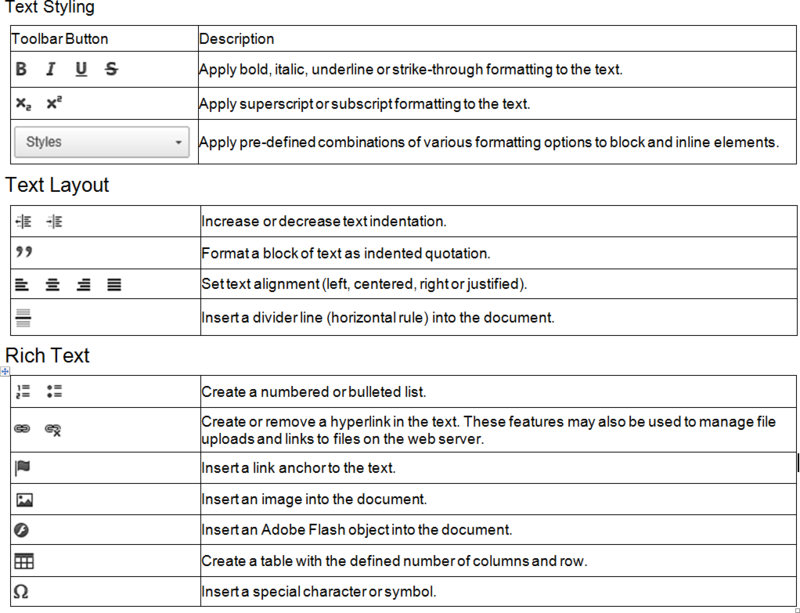 Elements Path – the section at the bottom of the editor displaying information about the HTML elements of the document (advanced feature). ITo resize the editor interface, click and drag the resizing grip in the bottom right-hand corner of the editor. To make writing more convenient, maximize the editor interface in the browser window. To maximize the editor, click the toolbar button, the editor interface will fill the browser window and stretch to its borders. To return to the default view and minimize the editor, press the same button again. Among the most common editing operations are cutting, copying, and pasting text. The editor not only supports these operations, but also makes it possible to affect the formatting of the pasted text and even paste a Microsoft Word formatted fragment. Because the cut, copy and paste functions need access to the clipboard of your operating system, some Internet browsers either block it when called from the toolbar, or ask you to explicitly agree to that. Should accessing the clipboard by clicking the respective cut, copy and paste buttons from the toolbar or context menu options be blocked, you can always perform these operations with keyboard shortcuts. Press the button on the toolbar. Open the context menu for the selected fragment by pressing the right mouse button, the Menu/Application key, or the Shift+F10 keyboard shortcut, and choose the Cut command. Use the Ctrl+X shortcut on your keyboard. Note this method works even when the browser blocks the toolbar's access to the clipboard, so this is the most reliable way of cutting the text. Open the editor context menu for the selected fragment by pressing the right mouse button, the Menu/Application key, or the Shift+F10 keyboard shortcut, and choose the Copy command. Use the Ctrl+C shortcut on your keyboard. Note this method works even when the browser blocks toolbar's access to the clipboard, so this is the most reliable way of copying the text. To paste a text fragment, start with cutting it or copying from another source. 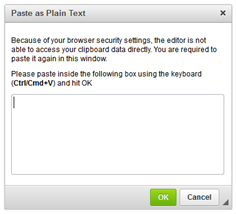 Depending on the security settings of your browser, either paste directly from the clipboard or use the Paste dialog window. Open the context menu for the selected fragment by pressing the right mouse button, the Menu/Application key, or the Shift+F10 keyboard shortcut, and choose the Paste command. Use the Ctrl+V shortcut on your keyboard. Note this method works even when the browser blocks the toolbar's access to the clipboard, so this is the most reliable way of pasting the text. 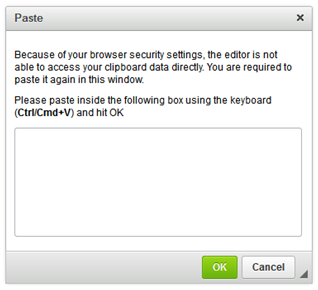 If direct access to clipboard is blocked, you will be asked to paste the text into the Paste dialog window using the Ctrl+V keyboard shortcut. To paste text that is already formatted text, but without preserving the formatting, paste it as plain text. To achieve this, copy the formatted text and press the button on the toolbar. If the browser blocks the toolbar's access to clipboard, a Paste as Plain Text dialog window will appear to paste the fragment into the text box using the Ctrl+V keyboard shortcut. Once pasted into the document, the text will lose all its formatting and you will be able to style it using toolbar options. The Find and Replace features allow the ability to quickly search the text as well as retain its consistency. They also make editing the text easier since you can batch change multiple occurrences of a phrase with just one mouse click instead of manually finding and modifying each one of them. Since both are closely related, they are implemented as one dialog window with two tabs that let you switch between the Find and Replace option. Note that because the default position of the dialog window is on top of the document in the editor, you might need to drag the Find and Replace window in order to see the highlighted terms. To find a word or a phrase on a page, in a quick and efficient manner, use the Find command. To open the appropriate dialog window, press the button on the editor toolbar. Find what – is the text field where you enter the word or phrase that you want to find. 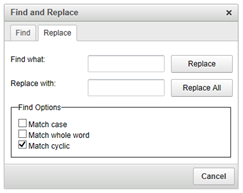 Match case – checking this option limits the search operation to words whose case matches the spelling (uppercase and lowercase letters) given in the search field. This means that the search becomes case-sensitive. Example: When Match case is checked and the search term is: "option", you will find all instances of "option" with this exact spelling but not when the word is spelled "Option" or "OPTION." Match whole word – checking this option limits the search operation to whole words. Example: When Match whole word is checked and the search term is: "option", you will find all instances of "option", but not the words "optional" or "options." Match cyclic – checking this option means that after reaching the end of the document, the search continues from the beginning of the text. This option is checked by default. Enter the search term and select the options, press the Find button and the editor will highlight the first occurrence of the term in the text, starting from the current position of the cursor in text and going down. If you want to jump to the next occurrence of the term in the text, press the Find button again. If you want to quickly find a word or phrase in your document and replace it, use the Replace command. To open the appropriate dialog window, press the button on the editor toolbar. Find what – is the text field where you enter the word or phrase that you want replace in the document. Replace with – is the text field where you enter the word or phrase that will replace the search term in the document. 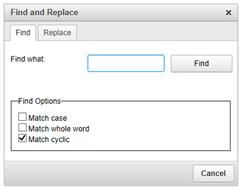 Match case – checking this option limits the search and replace operation to words whose case matches the spelling (uppercase and lowercase letters) given in the search field. This means that the search and replace becomes case-sensitive. Example: When Match case is checked and the search term is: "option", you will find and replace all instances of "option" with this exact spelling, but not when the word is spelled "Option" or "OPTION." Match whole word – checking this option limits the search and replace operation to whole words. Example: When Match whole word is checked and the search term is: "option", you will find and replace all instances of "option", but not the words "optional" or "options." Match cyclic – checking this option means that after reaching the end of the document, the search and replace continues from the beginning of the text. This option is checked by default. After you enter the search term as well as the replace term and select the options, press the Replace button. The editor will highlight the first occurrence of the term in the text, starting from the current position of the cursor in text and going down. If you want to replace the highlighted term, click the Replace button once more. Then, if you want to jump to the next occurrence of the term in the text, press the Replace button again. You can also replace all occurrences of the search term in the document in one go. In order to do that, press the Replace All button. The editor will then replace all occurrences in the whole document at once and display a pop-up window with the result of the operation. 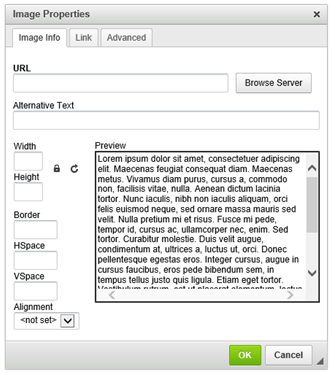 When you want to apply a formatting method to a larger text fragment, you can select it. The editor supports a few selection methods that you can use. To select all contents of the document, click inside editing area and press the toolbar button. 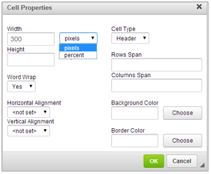 All document elements, including text, images, or tables, will become highlighted. You can now apply whatever action you wish to the selected content. Alternatively, use the Ctrl+A keyboard shortcut to select everything inside the editing area. A popular way to select document fragments is to use your mouse. Keeping the left mouse button pressed, drag your mouse over the document content that you want to select. The selection process will finish, when you release the mouse button. A document fragment selected with your mouse will become highlighted. You can also select individual words by double-clicking them. 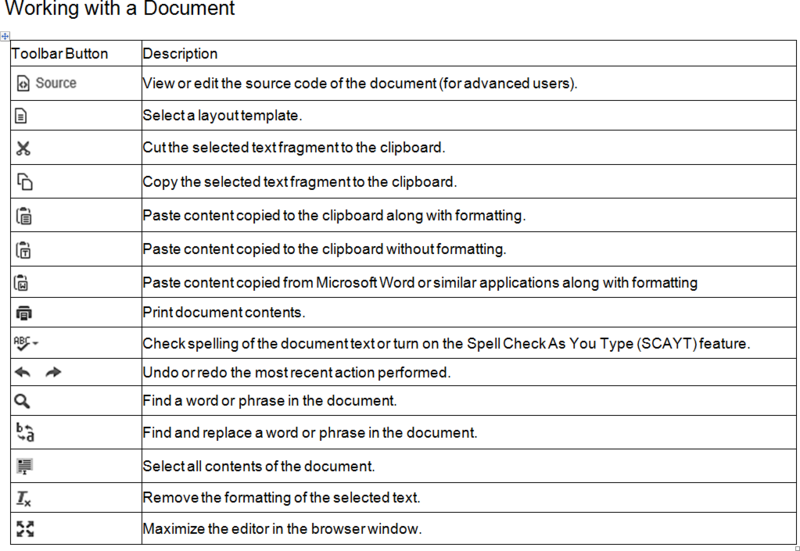 Note that a document fragment can also be selected with your keyboard. Using Shift+Arrow lets you select the text by letters and the Ctrl+Shift+Arrow — by words. Shift+End — from the cursor to the end of the current line. The combination of Ctrl+Shift and the Home or End keys let you select the text from the cursor to the beginning or end of the document, respectively. The Shift+PgDn and Shift+PgUp shortcuts select a text fragment of approximately the length of the editing area starting from the cursor and going down and up the text, respectively. Another method to select document contents is to use the editor elements path to highlight the HTML building blocks of the document. To use this feature, click an element's name on the elements path with your mouse. You can also use the Alt+F11 keyboard shortcut to enter the elements path, and then navigate between the elements with the Tab and Shift+Tab (or Left and Right Arrow) keys. To select an element with your keyboard, use the Enter or Space keys. The elements path is an advanced feature that requires some basic understanding of HTML. The same effect can always be achieved by selecting the text directly in the editing area with your mouse or keyboard. The editor makes it easy to not only change the style of your text, but it also makes it equally easy to remove these styles. To remove text styling applied to the document text, select the text fragment and press the toolbar button. 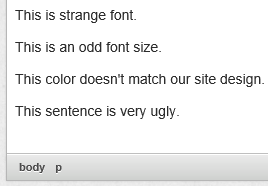 All text styling will be removed and the text will be displayed in the default font. The figure to the right shows a sample text with some styling — typeface, font size, colors — applied. After selecting the text and use the Remove Format function, all text styling is gone and the text is displayed with default paragraph formatting. Note that this applies to style properties that are applied to the HTML source. 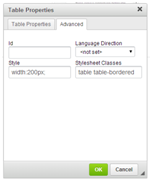 This category includes most text styling methods as described in the Text Styling section (without paragraph format) as well as text alignment and indentation. The Link feature is a powerful option to add documents (e.g., pdf), link to websites, link to an email address, create hyperlinks and link within a page (to an anchor). Highlight the text that the link is to be assigned. Click the button on the toolbar, or use the Ctrl+L keyboard shortcut. Click the Browse Server button. 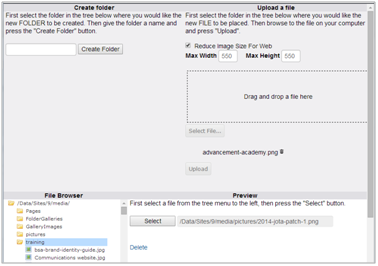 Under File Broswer, browse through the folders and select (click on) the appropriate folder to upload the document. Locate the document on your computer. 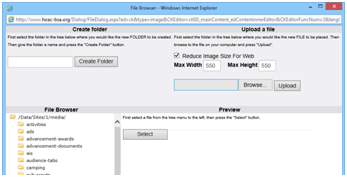 Under File Browser, browse through the file folders and click on the file, the click Select button under “Preview” on the right of the window. Type in Email Address, address of the recipient of the email (e.g., myname@example.com). 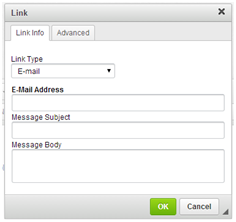 Optional: type in Message Subject (the text will be pasted into the subject line of the email message) and Message Body (text will be pasted into the email message as its content). 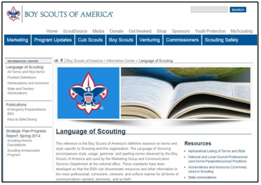 Type in URL of website (e.g., www.scouting.org). Optional: Click on the Target Tab and select new Window. 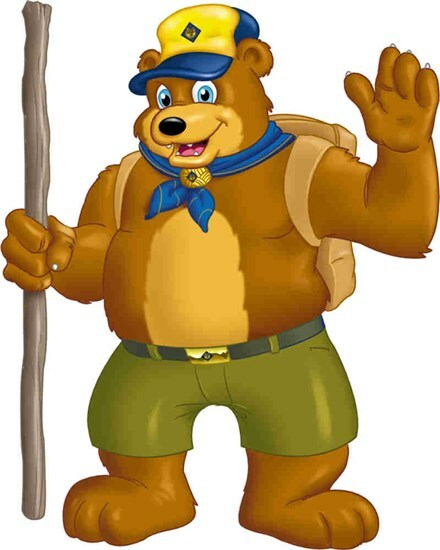 Notes: If you link to an external address, use the absolute path (e.g., www.scouting.org). If the resource is located on the same server, you can use a relative path that omits the domain name and starts with a slash (e.g., /scout-fair). If linking from a microsite to the SHAC site, use the absolute path. Create a link to a document or website. Click on Styles. Select button color. It's probably best to stick with the green button. Note: making changes to buttons can be difficult after initial making them. Ask for help, if needed. Removing a link is just as easy as adding it. 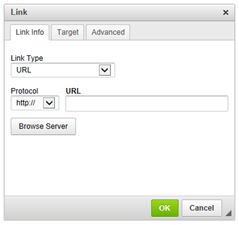 When the cursor is placed in a link, the button on the toolbar becomes active. Pressing the button removes the link and leaves plain text. Alternatively you can also open the element's context menu by pressing the right mouse button or using the Menu/Application key on your keyboard, and choose the Unlink command. To insert an anchor, left click on area of the page where the anchor should be placed. 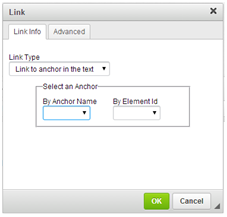 Enter a name for the anchor in the Anchor Name text box. Click OK, the icon will appear in the document. After adding an anchor, it will be visible to select it from the drop-down lists of the Link Info tab. Hint: Place an anchor on the row above. The icon can only be seen in edit mode. You can now create a link to your anchor with the button. The link will take the reader of your document to the section marked with the anchor. The Anchor Name has a drop-down list containing all the names of the anchors that have been established in the document. Removing an anchor is just as easy as adding it. When the cursor is placed in an anchor, the Remove Anchor context menu command becomes available. Open the element's context menu by pressing the right mouse button or using the Menu/Application key on the keyboard, and choose the Remove Anchor command. This option removes the anchor from the document and leaves plain text. To insert an image, click the button on the toolbar. 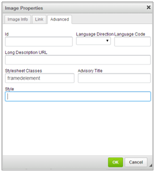 On Image Properties dialog window set configuration options that define image source, its size, display properties, or other advanced properties. The Image Info tab is the default tab that opens after pressing the button on the toolbar. 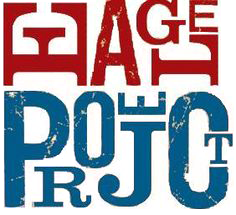 Images can be configured. URL – the web address of the image. Alternative Text – a short textual description of the image that tells users with assistive devices (like screen readers) what the image is about. Always provide your images with meaningful alternative text in order to make it accessible to users with disabilities.. 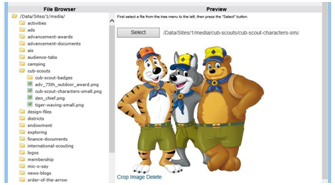 Under File Browser, browse through the folders and select (click on) the appropriate folder to upload the image. Locate the image on your computer. Click the Select button under “Preview” on the right of the window. Hints: do not make a graphic bigger than the default size. Do not make a graphic significantly smaller than the default size. object available in the Internet, like a simple URL address, a PDF document, or an online video. 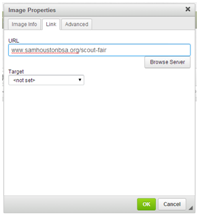 The Link tab of the Image Properties window functions similar to the Link Info tab of the Link Properties window. See Links and E-Mail for more information. 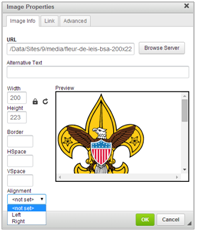 The Advanced tab allows for additional image options such as assign it an ID, a class, a longer description, a tooltip, or CSS style properties. It is meant for advanced users with knowledge of HTML as well as CSS, and gives nearly endless possibilities as far as the presentation of the image is concerned. Select the number of rows and columns. 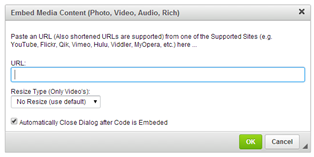 To embed a video, click the button on the toolbar. Then type in the URL. A Content Template is a feature that lets the structure of the content and preserve consistency across multiple pages to be controlled. Templates are pre-defined, ready-made content with layout, text formatting and styling as well as other elements. To use one of the templates, press the button on the toolbar. Since creating and adding new templates is an advanced feature, please contact the council webmaster if you need assistance. Each template listed in the window contains a title, an image presenting the schematic outline of the template as well as its description. 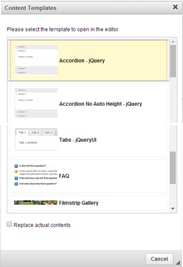 In order to select a template, choose it from the list in the Content Templates dialog window and click once. The dialog window will close and the selected template will be applied to the document. The Content Templates dialog window contains only one configuration option: Replace actual contents. on the toolbar or the Ctrl+Z shortcut on your keyboard. If you leave the Replace actual contents option unchecked, the template will be inserted in the current position of the cursor in the document. Copy the source (html) code before saving if you have worked really hard on page. Click on Source, then Ctrl+A and Ctrl+C, then paste into notepad to save. Make sure to update your units page is updated with accurate unit leader and commissioner contact information, feeder elementary school and troop meeting nights. Ask your commissioner team for help in gathering this information. Feeder elementary schools are important as this will show up in google searches when parents are trying to locate which pack to join. Plus accurate feeder schools can help serve as the official source for turf wars that occur when a volunteer tries to recruit at schools not assigned to their unit. Did you know that the district websites have a newsletter feature already set up and ready to go? 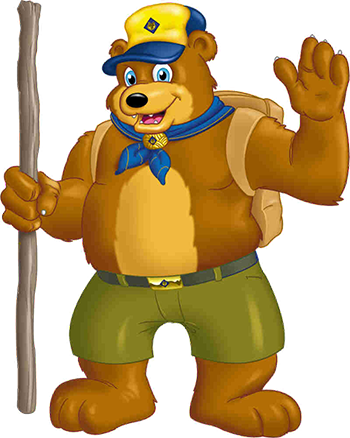 There is a link on the home page that directs Scouters to the communications page to sign up. There is a "Send a Newsletter" page under resources that provides a link and instructions on sending newsletters. Contact Darlene if you have any questions. We have a new "What to Bring" to training page. Please ask your district training chair to review the list. Note: a medical form is always required to be on the list of things to bring. These pages can currently only be viewed by webmasters. Please ask your district advancement chair if they would like these pages turned on. This was announced at Council Coordinated. The forms can be emailed to the advancement chair and/or the advancement committee. Have the advancement chair check out http://big-cypress.shac.org/request-eagle-scout-board-of-review and http://big-cypress.shac.org/request-eagle-scout-project-review as examples. 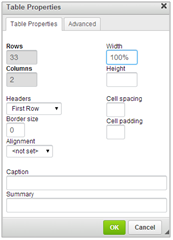 We can customize the forms with additional specific instructions if needed.